The Scoop: For successful singles who are tired of not knowing who they’re really meeting on traditional dating sites and apps, The Lodge Social Club offers an alternative. The global dating app is designed for people who want the opportunity to meet matches both online and offline. The Lodge Social Club hosts exclusive pop-up events in cities around the world and triple vets its clients, so singles can make genuine connections. Kailen said successful men and women who are ready for committed, healthy relationships do exist. The harder problem to solve is where to find them. Kailen Rosenberg founded The Lodge Social Club as a place for singles to meet quality matches. Since not everyone could secure her matchmaking services, Kailen decided to create a place for singles to find each other more organically. She developed The Lodge Social Club, a dating app geared toward finding true love for people who are ready for it. The Lodge Social Club is more than a dating app, though. Members can access exclusive invitations to sophisticated social networking events held around the globe. At these events, they can meet the people with whom they’re connecting online or people with whom they haven’t matched yet. Many singles who have tried online dating understand that they may have to deal with profiles of people who aren’t who they claim to be. To ensure The Lodge Social Club would be different, Kailen and her team implemented a three-part vetting process for every new member. First, members undergo a criminal background check. That helps eliminate potential members who use online dating as a way to scam money out of people. Next, members submit identification, which shows that they are who they say they are. Then, the Lodge differentiates itself even further with a third step called The Real Reveal test. It’s an 86-question test that not only teaches members about their own dating style but also helps the app find compatible singles for them. 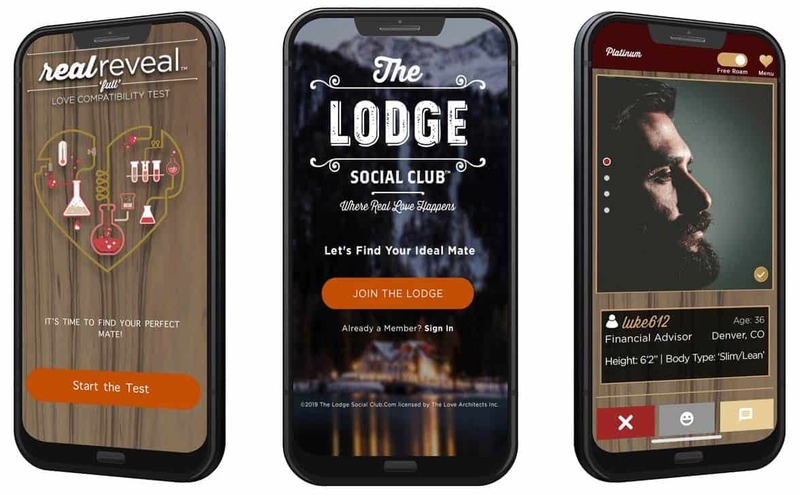 The Real Reveal Test helps The Lodge Social Club app more accurately pair compatible members. “It is fool-proof, and it’s fun. It identifies what kind of mate you are — an ego mate, soul mate or life mate — and it also shows you a lot about how you show up as a partner in love and relationships,” Kailen said. “The algorithm is intelligent, inspiring, and honors the user,” Kailen said. Kailen created the test along with Harville Hendrix and Helen LaKelly Hunt, best-selling authors who are on Oprah’s short list of love experts. The app launches soon and includes two levels of membership: bronze and platinum. Members are invited to attend a variety of pop-up events with platinum members receiving a few extra invites. The events are typically in association with high-end luxury lifestyle brands. The activities range from small gatherings of 40 singles to potentially hundreds depending on the venue. Kailen added that the events aren’t gimmicky — she prefers elegant simplicity. People who join The Lodge Social Club and attend its events also get the satisfaction of knowing they’re giving back. A percentage of the membership fee from each new person who joins The Lodge Social Club goes to a charitable organization. The company currently works with the Ronald McDonald House and Catholic Charities to help children, but the team wants to expand its efforts and is looking into charities that support members of the military. “It’s about the energy of love. When we are in a healthier space, and we’re loving one another in a healthier way, then we are spreading the energy of love — and that is, indirectly, healing the world,” Kailen said. “It’s about giving back and doing more than just for ourselves. The charitable contributions are part of what Kailen said she considers her duty as someone whose job is to facilitate love. As someone who has worked in the dating industry for years, she has seen the monetary benefits of running a business — as well as where most of the profits flow. Having worked in the matchmaking industry for more than 26 years, Kailen has gained invaluable experience in determining compatibility. Now, after working on perfecting The Lodge Social Club for a couple of years, her team of developers in Silicon Valley are putting the finishing touches on the app before it goes live. The Lodge Social Club app and events provide the right environment for singles to connect. You’ve got the ambiance, the energy, and, most importantly, people who are looking for love. To that end, Kailen plans to reach out to new members to get their feedback about the app and the events to see what she and her team are doing right and what they can improve on.